Wynne's private member bill comes after an extensive CBC Fifth Estate investigation exposed serious problems with a Transport Canada 1984 study that was the basis for a decades-long campaign against the use of seatbelts on school buses. Former Ontario premier Kathleen Wynne plans to table a private member's bill on Thursday calling for mandatory seatbelts on school buses in Ontario. The Liberal MPP, who represents the Toronto riding of Don Valley West, plans to recommend three-point seatbelts in all new school buses by 2020 and retrofits for all existing school buses by 2025. "I recognize that there has to be a transition period because these are small businesses and the operators will need some time to retrofit their buses," she added. The move comes after an extensive CBC The Fifth Estate investigation exposed serious problems with a Transport Canada 1984 study that was the basis for a decades-long campaign against the use of seatbelts on school buses. The Fifth Estate also learned that government officials have known for years that seatbelts save lives and prevent injuries on school buses — information the department has kept hidden from the public. A 2010 Transport Canada report that found school buses "failed" safety tests and did not do enough to prevent "serious injuries" was not made public until CBC asked for it in September. "That's the missing piece for me," Wynne said in an interview. 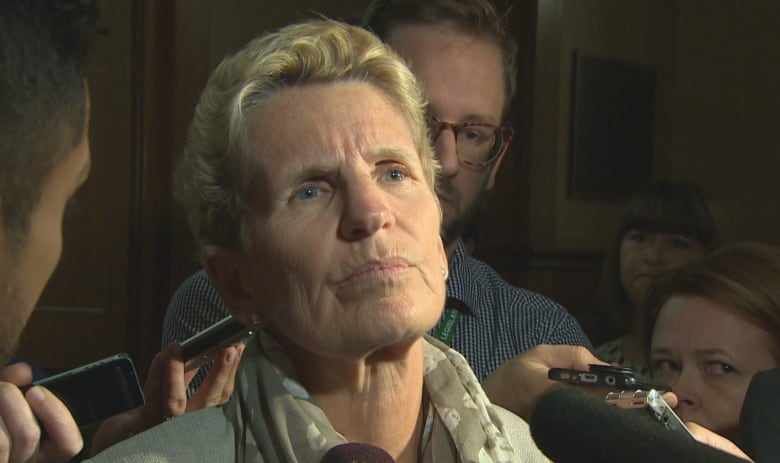 Wynne, who has also previously served as transportation minister, says she has never acted on the issue before because she didn't have "all the information." The issue was already raised in Ottawa following The Fifth Estate's investigation when federal Transport Minister Marc Garneau told the House of Commons in October that Transport Canada will investigate whether seatbelts are necessary on school buses. "As soon as I heard the report through The Fifth Estate, and I came to know that there was a Transport Canada report from 2010 that I'd never seen that basically contradicted the 1984 report from Transport Canada, which is the one that was always referred to by our officials, I just felt that I needed to shine a light on this through raising it in the Legislature," she said. Wynne consulted with a number of stakeholders in penning the bill, including the Ontario Safety League (OSL). "The reality is that safety is a non-partisan issue so even in discussing this with the government members, they see this as one of those evolutionary steps in safety," OSL CEO Brian Paterson said. Bob Nichols, spokesperson for Ontario's transportation ministry, said in an email on Wednesday that elements of the private member's bill may fall under federal jurisdiction. "While we support the intent of Bill 56 and look forward to the debate of this legislation, it's important to note that Transport Canada is responsible for setting the safety requirements for new vehicles and to determine which vehicles are required to be equipped with seatbelts," he said. He said the ministry will continue to work with Transport Canada to find the best way to ensure school bus safety in Ontario. If the bill is passed by the legislature, he said ministry staff will analyze it to determine how it can be implemented and will look at such issues as driver responsibility and costs to industry.